Alongside other OS X Mountain Lion announcements at its Worldwide Developers Conference last month, Apple announced an Up-to-Date program allowing any customer purchasing a Mac on or after June 11 to receive a free upgrade to OS X Mountain Lion once the operating system is released to the public. With OS X Mountain Lion being released only via the Mac App Store, the free upgrade is being delivered a redemption code for the store. While the company has yet to officially announce it and almost certainly will not do so until OS X Mountain Lion itself actually launches, the company's Up-to-Date online application form is already live. Users are required to enter their date and location of purchase for the qualifying Mac, fill out personal contact information, and enter the serial numbers of machines eligible for the free upgrade to OS X Mountain Lion. 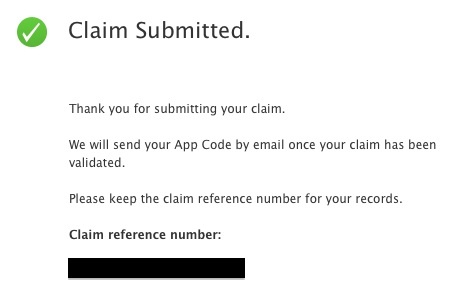 Once all information has been submitted, Apple generates a reference number for the claim and the actual redemption code is delivered via email. In our testing, the redemption code arrived as a password-protected PDF attachment within seconds of submitting the online form, with a second email containing a password for opening the PDF arriving at the same time. 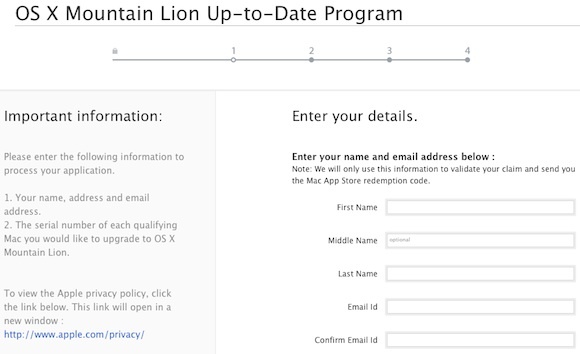 Thank you for participating in the OS X Mountain Lion Up-To-Date program. The content code that allows you to download and install OS X Mountain Lion from the Mac App Store is in the file attached below. You will receive the password to unlock the attached files in a separate email. Your content code may be redeemed immediately through the Mac App Store and will not expire. 1. Open the Mac App Store application. 2. Select “Redeem” in the Quick Links section of the Mac App Store. 3. Enter your content code. If you have questions regarding the redemption or installation of your software from the Mac App Store, visit www.apple.com/support/mac/app-store/. To redeem your content code you need the latest version of the Mac App Store application, an Apple ID, and Internet access (fees may apply). You can create an Apple ID at appleid.apple.com/us. As a reminder, content codes may not be resold and can only be redeemed by people above the minimum age specified by the terms and conditions of the Mac App Store in your country. Apple is not responsible for lost or stolen content codes. You may review the Terms of Service for the Mac App Store at www.apple.com/legal/itunes/ww/. Attempting to redeem the OS X Mountain Lion code in the Mac App Store does not yet provide access to the update, however, as it has yet to go live in the store. Entering the code simply yields an error noting that it is "not recognized as a valid code". OS X Mountain Lion will be released later this month, with hints suggesting that it could arrive this Wednesday, July 25. Update 10:12 AM: Apple appears to have taken the Up-to-Date application offline. Since I was in a mall this a.m., I stopped by the Apple Retail Store and copied down the serial numbers of three of their retina display MBPs on display. We'll see if those serials have been blocked or if they yield a Mountain Lion upgrade when the time comes. Are you trying to get a free upgrade to ML? It's $20 dude, dont be lame! Sometimes I really miss the down-voting arrows. You are pathetic. People like you that ruins for everybody else. Clearest indication its days away! That's pretty pathetic. While it won't work without a receipt number attached to each of those serial numbers.. It is still kind of sad that you spent that time and gas just to snag a few $20 bills. Slow day with the purse snatching or were you just bored? I have 3 Macs to do and will choose the early hours after the first rush is over before downloading. Apple promised the free upgrade to Mountain Lion on their website when I bought my new MacBook Pro in June. Why would I now have to apply for it? And why is this news at all? They can't just give it to everyone for free, you know? They need a way to know that you bought your mac on or after June 11th. So by sending in this request they can verify through serial number that your mac was one that was purchased on or after June 11th. Its just their way of making sure the right people are getting the software for free. No. One upgrade for your new machine. Any others and you have to buy it. It's been heavily discussed on these boards. I don't think that is correct. Just like any apple app you purchase, you can sign in and redownload it on another Mac, iPhone or iPad. I just bought two macs and I am sure that Apple will give me one code to purchase the free upgrade then I will be able to login on each machine and upgrade.